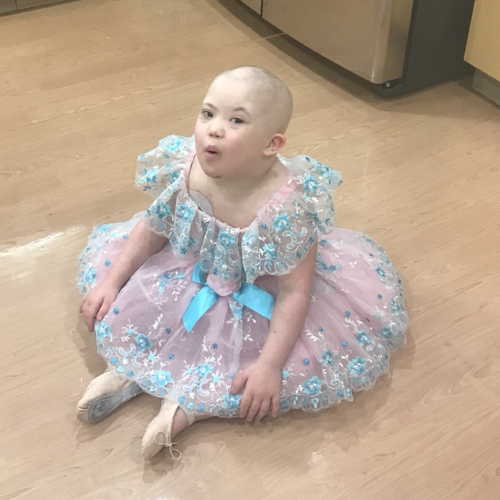 Lily is a spunky five-year-old girl with Down syndrome. She loves to dance, sing, paint and dress up. Last September, she was diagnosed with an aggressive subtype of acute myeloid leukemia. Lily has had to undergo four rounds of intensive chemotherapy, a trip to the PICU and heart issues related to her treatment. Lily’s mom, Christel, has an advanced degree, but had to take a leave of absence from her full-time job as a teacher and give up her part-time job as a professor at a local university. Lily’s dad’s work is inconsistent, so the loss of Christel’s income has dramatically impacted their finances. Lily’s doctors have determined that she needs a bone marrow transplant at the end of April. This will require longer hospital stays for Lily and Christel and more time away from Lily’s brother and sister at home. A Family Reach grant has covered April’s rent and provided much-needed financial assistance. This grant will allow them to be by Lily’s bedside during her transplant and help them focus on recovery until Christel’s monthly teacher salary kicks in this summer. The family expressed their sincere gratitude upon receiving the support. “Thank you so much. I know this help will take me until June when I will get my full pay again,” said Christel. Interested in helping families like Lily’s? Click here to become a Key Holder.